QUOTE: "He should be stronger than that. That's what his mother wanted isn't it?" The tradition of Junichero men passing their knowledge from father to son has continued for generations. Tanazaki, however, wanted to end this tradition. Any assassin who wants to prove his worth to the world will seek out the Junichero and kill one of the legendary clan. Tanazaki hoped to end this cycle, and wished the secret arts would die with him. Tanazaki's wife was a peaceful woman, but as she carried their baby she pleaded for Tanazaki to change his mind. What would happen to her son if he were not equipped with the skills necessary to defend himself from these dangers, she wondered. She died giving birth to their son, Ori. But not before making Tanazaki swear to her that he would train Ori in the ways of the Junichero. Tanazaki lives up to the masterful Junichero clan. 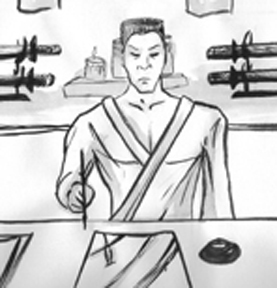 He is a swordsman with few peers, able to take on numerous enemies with a single katana. Tanazaki also excels as a fisherman, a skill which has been passed down nearly as long as those of the martial arts. Now in his later years, Tanazaki spends much of his time practicing Sumi-E, Japanese brush painting. Now an aging, bitter man, Tanazaki is less interested in training his son as he is reprimanding him. Many times, it is his father Re Tung that comes to young Ori's defense. Old age is not something many Junichero have experienced though, and Tanazaki knows that a time may come when a lucky assassin may take his father's life. When that happens, it will be the son's responsibility to seek vengeance. Until then, Tanazaki wants to live out his life in peace, working on his paintings and fishing. 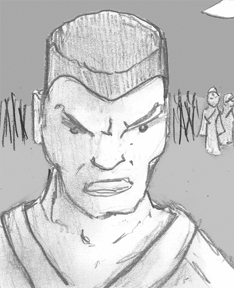 The occasional attack by rival clans often interferes with those plans. When he must, Tanazaki unsheathes his sword. When he does, there is often no one left to tell stories of how brutal and magnificent he is with a katana.